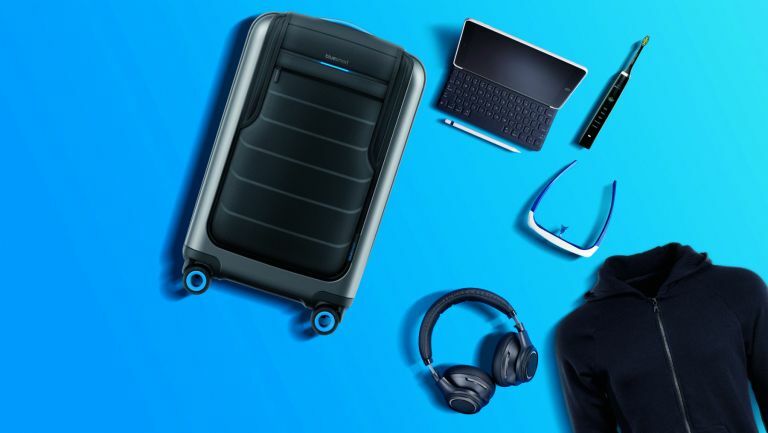 This connected suitcase is small enough to carry onto the plane, and the easy-access top hatch means there will be no clothes-spewing scenarios when grabbing or stowing your tech quickly. It also features app-controlled locking, a built-in scale, location tracking and dual USB chargers so you can juice up your phone on the go, then request an Uber at your destination. Long flights whizz by when you have stuff to do, and we don't just mean draining the bar. Invest in this small-yetpowerful device and you can finish that report, kick back with Game Of Thrones, play Candy Crush Saga or relax to some Santana. The iPad's killer Retina Display, superior audio, 64-bit A9X chip and ten-hour battery life should easily see you through a flight to LA, Tokyo or beyond. Don't forget the Smart Keyboard! Noise-cancellation levels on Plantronics' wireless headphones are adjustable to block out as much or as little ambient noise as you like. Battery-conserving tech pauses audio when you remove the cans or when they're out of range, meaning you can stream up to 24 hours of your favourite tunes or movies. For some, it's not the longhaul flight itself that causes the most pain, but the switch in time zones and the resultant jetlag. The Luminette light-therapy glasses shine a beam of blue-enriched, sunlight-mimicking white light at your eyes, helping to regulate your biological clock. Plug details of your destination, time of arrival and more into the MyLuminette app, don the glasses when your personal schedule alerts you to, and you'll conquer jetlag twice as fast. Long flights have a way of making your mouth taste and smell like you've been dining on dog food. If you don't deal with it sharpish, you're in danger of making the person you're meeting bolt for the door. This Philips toothbrush has five cleaning modes that deliver up to 31,000 brush strokes per minute. The handy USB travel case means you can charge it via your laptop or the seat-back ports on the plane, too. This might look like a simple hoodie, but the genius behind the 100 per cent cotton Aros garment is the inflatable hood. It'll deliver head and neck support, not to mention warmth, and will help you to get some rest before your big meeting upon landing.